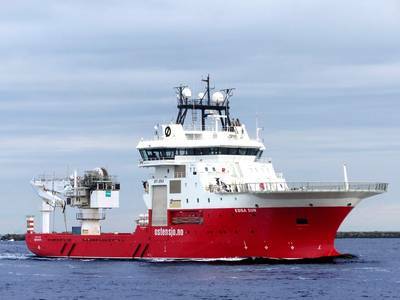 Dutch offshore surveyor Fugro said Friday it is set to commence its first project using the multipurpose remotely operated vehilve (ROV) support vessel, Edda Sun, with mobilization for an inspection, repair and maintenance (IRM) contract planned for March 2019. The 2009-built, versatile and high weather capable Edda Sun is on a two year charter from owner Østensjø Rederi to Fugro, who said the vessel enhances its IRM, construction and decommissioning support services in Europe. The 85-meter Edda Sun can accommodate up to 72 personnel and is equipped with a Sikorsky S 92 compatible helideck and a 70T/11m heave compensated knuckle boom deck crane. It features 625m² of free deck space for project use and has two crane-deployed inspection class ROV systems and one hangar-deployed FCV 3000 work class ROV system permanently installed. The vessel also has integrated ROV control, online inspection, survey and offline processing/review offices and client offices.